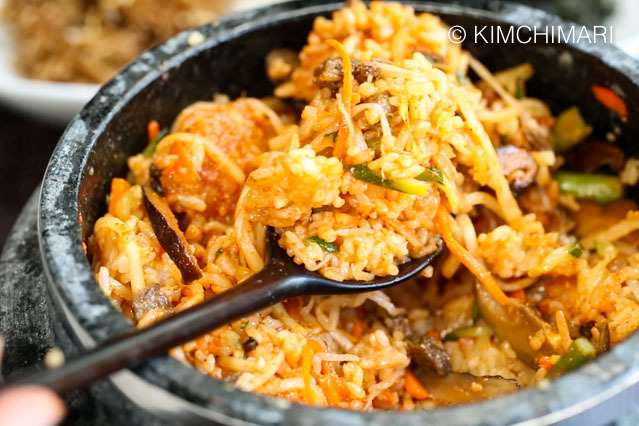 Dolsot Bibimbap (Korean Stone Pot Rice Bowl) is a classic Korean rice dish that’s served with various vegetable and meat topping which comes SIZZLING HOT in a stone pot. Which means.. you will have a fantastically browned burnt rice in the bottom – making this dish extra delicious! 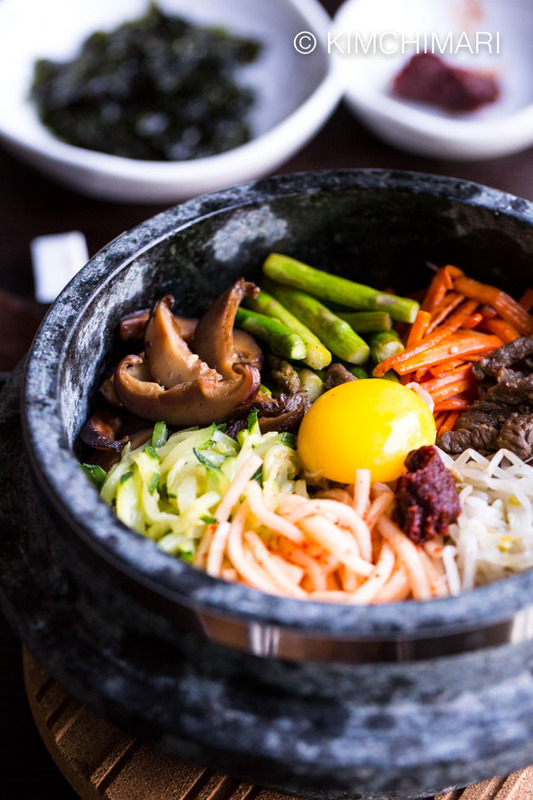 If you can handle piping hot foods, Dolsot Bibimbap is definitely the most delicious way to have bibimbap. Restaurants usually serve this dish CRAZY HOT with the rice still browning and crackling in the bottom of the pot as it comes to your table. And because the pot is so hot, they will usually serve raw egg yolk instead of fried egg which will instantly get cooked as you mix your rice and toppings with yummy gochujang. 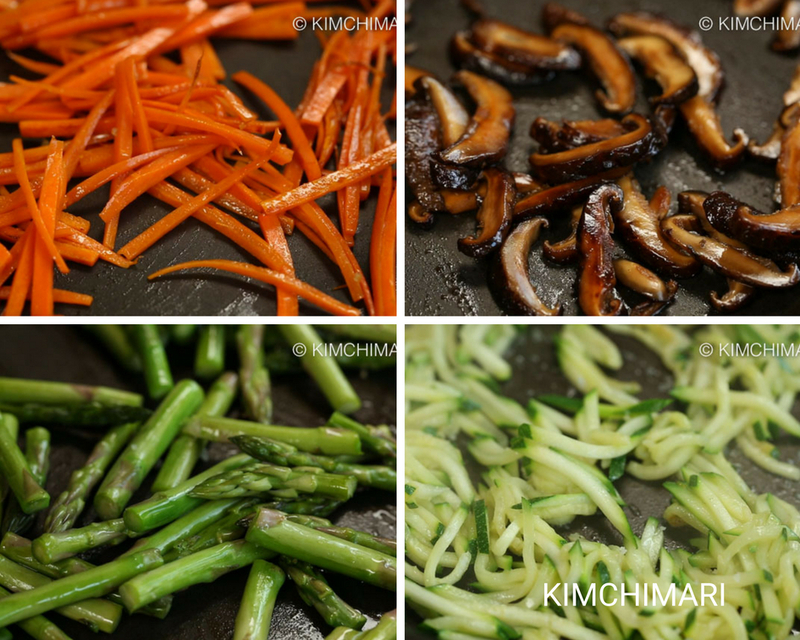 In this post, in addition to sharing how to make a Dolsot Bibimbap, I share a more modernized EASY bibimbap recipe with EASY TO GET INGREDIENTS. 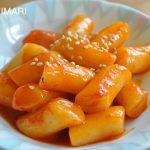 No need to go to a Korean grocery store for special ingredients, these are vegetables that you can most likely get from your regular grocery store. 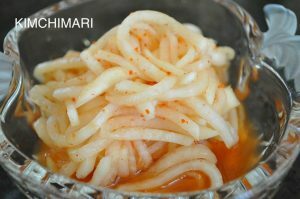 Just to make sure, I visited my local Safeway store to buy all the ingredients for this recipe (except for my home made gochujang of course. 😉 ) so you should be able to do it too! 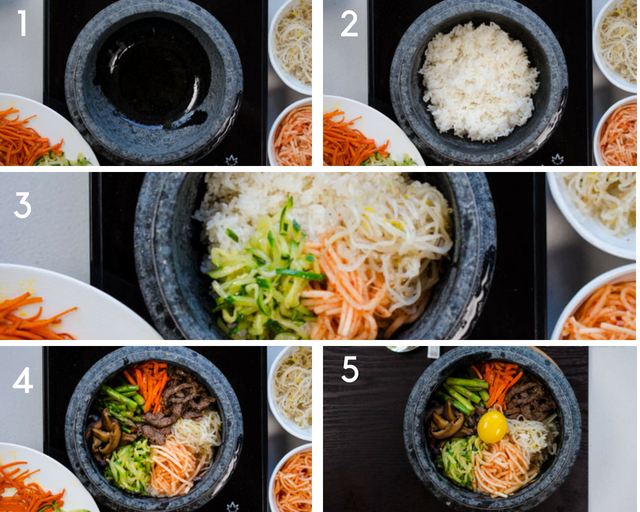 Dolsot Bibimbap vs Bibimbap – what’s the difference? The main difference is “Dolsot” 돌솥 or Stone Pot and not much else. Dolsot bibimbap comes in a hot stone pot that has been coated with sesame oil and then cooked with rice and all the toppings in them until the rice starts to sizzle. This is so the rice at the bottom of the pot gets browned and crispy. There’s usually no clear difference in the toppings because it’s Dolsot bibimbap but because it can be kept warm, fatty beef like kalbi and seafood (squid and octopus) work really well when served in Dolsot. 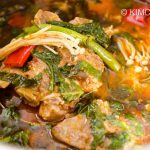 What can I use for Dolsot bibimbap if I don’t have Dolsot (Stone Pot)? 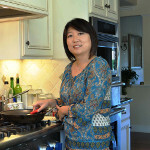 cast iron pan – I bought an 8 inch Lodge Cast Iron pan for the video and it worked great as an individual serving dish. See pic above. You can also use other cast iron pots/pans and they should work fine. ttukbaegi – ceramic hot pot that’s used for jjigae (e.g. soft tofu stew). 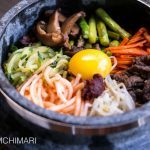 What are some topping variations for Dolsot Bibimbap? fresh greens – fresh lettuces (romaine/green leaf/iceberg), fresh perilla leaves, fresh crown daisies adds great freshness! The toppings usually represent the unique produce of each province in Korea and so the bibimbap will be different based on the area you are in. In terms of Dolsot Bibimbap, the one in Jeonju is very famous – especially the one with Yukhoe (beef tartar). Cook short grain rice. Rice cooker is the easiest way to make rice if you have one. Soak dried Shitake mushrooms in warm water until fully soft throughout. About 15 min or more. You can also just leave it overnight in the fridge if you want to make it ahead. While mushrooms are soaking, peel and julienne Carrot, Zucchini and Daikon radish. Use a mandoline slicer for the most uniform and pretty cuts. But probably carrots are more easily cut with a knife as they may be too hard for the mandoline. Break off hard ends of Asparagus and cut into 3rds. When Shitake mushrooms are fully rehydrated, remove stem and slice thin. If using Beef Chuck/Stew/Steak meat, cut into thin strips. I used a Chuck Eye Roll Steak here. 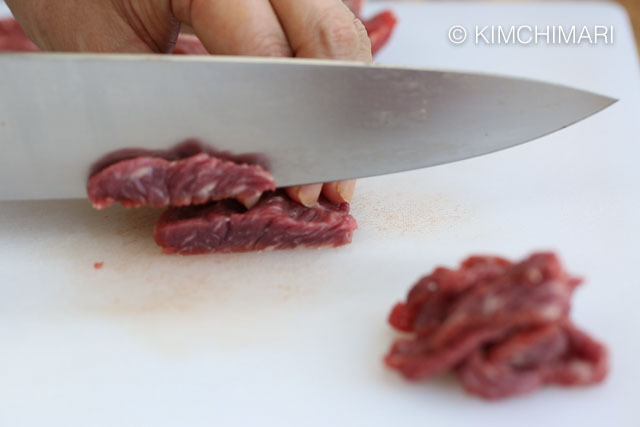 I first split the meat to make it into a thinner cut and then sliced them into strips like in the picture. See video for more details. Substitute Ground Beef if you don’t fee like cutting beef. 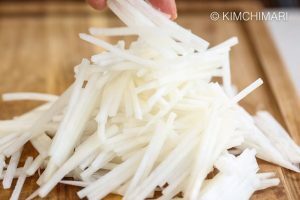 Make Musaengche (Korean Radish Salad) with julienned radish. Click on recipe link (left) for more details or see video. 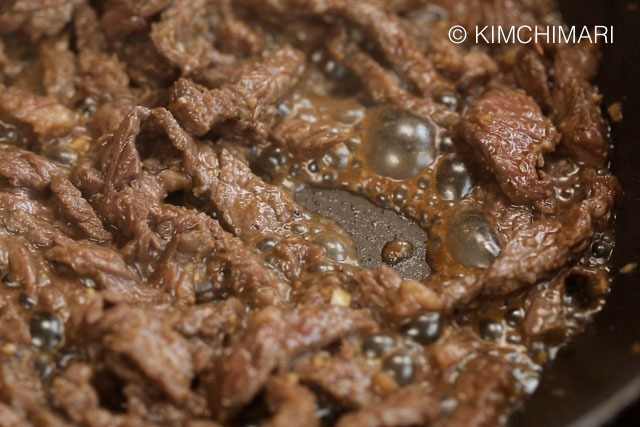 Marinate beef by adding soy sauce, sugar, sesame oil, rice wine, chopped garlic and black pepper. Mix with your hands. Boil a pot of water and cook Sukju Namul (Bean Sprouts). Click on recipe link (left) on how to make it or see video. Let’s start making everything else! Try to follow the order I have below so that you don’t have to wipe or clean the pan in between each ingredient. Zucchini: Heat about 1 Tbs vegetable oil in frying pan on medium heat. Saute julienned Zucchini. Sprinkle some sea salt. Cook for 2-3 minutes until zucchinis are soft like in the picture. Transfer to a plate and set aside. Carrots: To the empty frying pan, add a little more veg oil and sauté Carrots the same way as zucchini with a bit of sea salt. Until carrots are soft and cooked – about 3 min. Transfer to a plate and set aside. Asparagus: Next, heat a little more veg oil and sauté asparagus for 2-3 minutes in the same frying pan on medium heat. Sprinkle sea salt and black pepper. 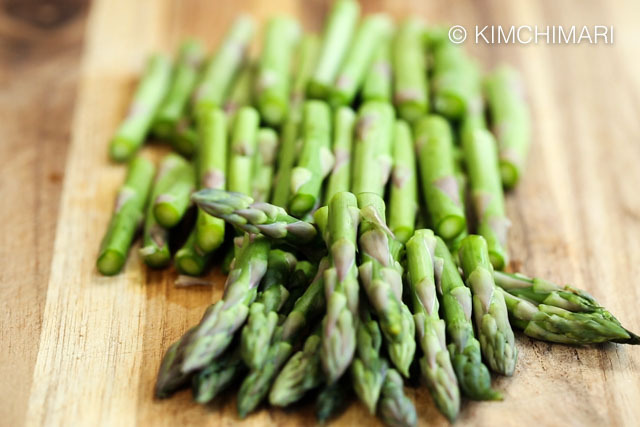 Sauté Asparagus until they are just cooked – tender yet still a bit crunchy. Transfer to a plate and set aside. Shitake Mushrooms: In the same pan, add sliced Shitake mushrooms. Sauté for 1-2 minutes and then add soy sauce. Quickly stir to evenly distribute soy sauce onto the mushrooms. Cook for 1-2 minutes more. Transfer to a plate and set aside. Beef: Lastly, add increase the heat to med-high and add marinated Beef in the frying pan and sauté on medium high heat until well done. If there’s a lot of liquid, let it cook for a little more until the marinade is mostly reduced. Set aside. Egg: Depending on how you want it, either separate just the egg yolk and set aside or fry egg over easy. Take a stone pot (dolsot) and coat the bottom of the pot with sesame oil. If you don’t have a stone pot, you can use a cast iron pot or pan or ttukbaegi (ceramic or clay pot). Add about 2 cups of cooked rice (depending on how hungry you are) for each pot. This recipes makes 2 pots – enough for 4 people. Spread rice evenly throughout to maximize amount of burnt rice. Top rice with all the toppings you made above: bean sprouts namul, radish salad, zucchini, mushrooms, asparagus, carrots and beef. Alternate between bright and dark colors to create a a beautiful color contrast. Heat filled bowl or pot on medium low heat for about 10 minutes (covered for the first 3-4 minutes until rice starts to sizzle and then uncovered for remaining time). Cook until rice at the bottom of the pot is nicely browned and burnt like in the picture. Remove from heat. 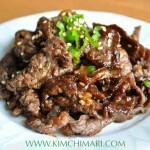 SERVE with some gochujang or gochujang bibim sauce and some extra sesame oil. 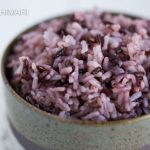 Don’t use wet mushy rice. Keep moisture content low of all the ingredients as much as you can help it. Egg is a MUST. Egg yolk disappears into the rice when mixed. If you want to taste it separately, add fried egg on top. Be patient and let the rice become fully burnt and crispy. 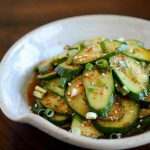 Serve with some extra gochujang and sesame oil. Try both plain gochujang or cho-gochujang bibim sauce . See which one you prefer. 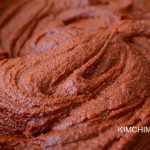 Plain gochujang will give you a more deeper and smoky flavor. The cho-gochujang will add brightness to the dish. 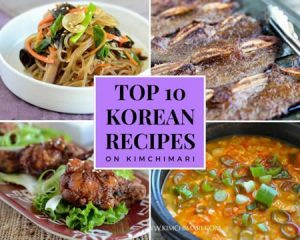 And add the sauce gradually – I personally prefer adding less gochujang so I can enjoy the flavors of the ingredients more. For EXTRA FLAVORFUL rice, cook rice in beef broth in the stone pot and then add toppings after rice is cooked. I know this takes a lot of time but the good thing is that once you have the ingredients ready, it is easy to assemble and cook. 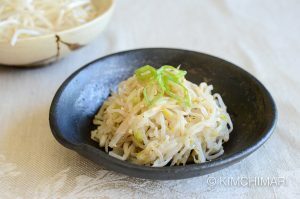 Make radish salad and bean sprouts ahead of time or even the day before and keep in fridge. You can also marinate the beef the day before. Check out my Traditional Bibimbap (non-stone pot) version here. Have a Bibimbap Potluck Party!! 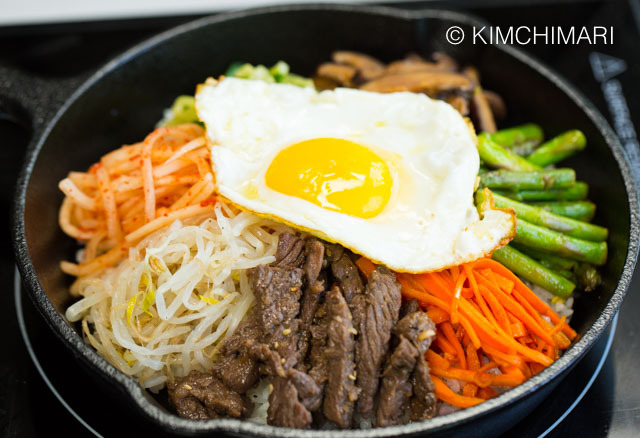 Many Korean Americans like to have a bibimbap potluck party by having each person bring one topping each – a namul or beef or pork bulgogi or even ohjingeo bokkeum. The host can cook the rice and make the gochujang sauce and perhaps some soup or jjigae to go with the bibimbap. It is such a wonderful way to enjoy this fabulous dish with little effort. I had very mixed feelings about bibimbap when I was a kid. I liked the flavor of it but I had couple traumatic experiences with it. 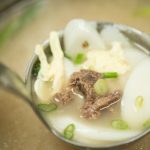 The loong and fibrous namul like gosari and kongnamul sometimes did not get chewed properly by me and got stuck in my throat!! And made it hard for me to swallow!! 😰 I think I was like 7 or 8 years old but still..
☆ Did you make this recipe? I hope you can give me a 5 star rating below! 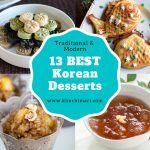 You can also FOLLOW ME on FACEBOOK, PINTEREST and INSTAGRAM or join my FACEBOOK GROUP to see, ask and share everything about Korean food with others just like you! 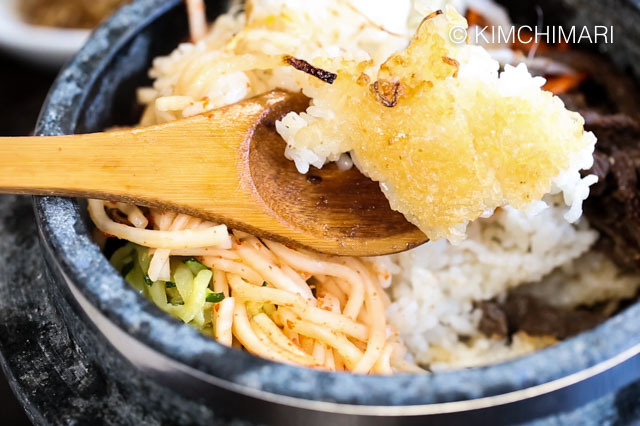 Dolsot Bibimbap comes in a hot stone pot that is served SIZZLING HOT at your table. Which means you will have a fantastically browned burnt rice in the bottom – making this dish extra delicious! While mushrooms are soaking, peel and julienne Carrot, Zucchini and Daikon radish. 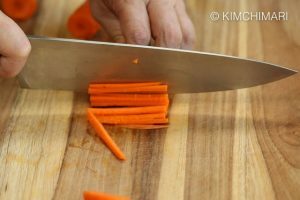 Use a mandoline slicer for the most uniform and pretty cuts but for probably not for carrots as they may be too hard. If using Beef Chuck/Stew/Steak meat, cut into thin strips. You can also use ground beef. Let's start sautéing everything else! Try to follow the order I have below so that you don't have to wipe or clean the pan in between each ingredient. Zucchini: Heat about 1 Tbs vegetable oil in frying pan on medium heat. 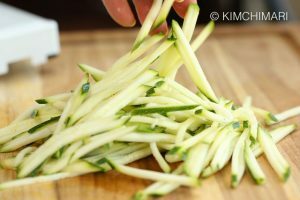 Saute julienned Zucchini. Sprinkle some sea salt. Cook for 2-3 minutes until zucchinis are soft. Transfer to a plate and set aside. Carrots: In the empty frying pan, add a little more veg oil and sauté Carrots the same way as zucchini with a bit of sea salt. Until carrots are soft and cooked. Transfer to a plate and set aside. Asparagus: Next, heat a little more veg oil and sauté asparagus in the same frying pan. Sprinkle sea salt and black pepper. Sauté Asparagus until they are just cooked - tender yet still a bit crunchy. Transfer to a plate and set aside. Beef: Lastly, add marinated Beef in the frying pan and sauté on medium heat until well done. If there's a lot of liquid, let it cook for a little more until the marinade is mostly reduced. Set aside. Take a stone pot (dolsot) and coat the bottom of the pot with sesame oil. If you don't have a stone pot, you can use a cast iron pot or pan or ttukbaegi (ceramic or clay pot). Add about 1-2 cups of cooked rice (depending on how hungry you are) to pot. Spread rice evenly throughout to maximize amount of burnt rice. Top rice with all the toppings you made above: bean sprouts namul, radish salad, zucchini, mushrooms, asparagus, carrots and beef. Alternating between bright and dark colors creates a great color contrast. Heat bowl or pot on medium low heat for about 5 minutes or until rice at the bottom of the pot is nicely browned and burnt. Remove from heat. Add a raw egg yolk or fried egg on top and SERVE RIGHT AWAY! 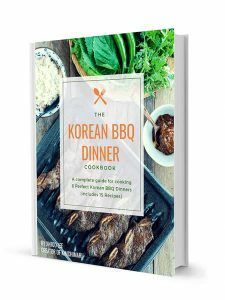 « Korean BBQ Dinner Cookbook – FREE to subscribers! Love your recipes. Do you have a cook book I can purchase? I love the hands on of a cook book, old fashion I guess. Aww.. thank you so much for asking!! No, I don’t yet have a printed cookbook. I totally agree with you that a paper book is so lovely to have. I hope to publish one someday.. it’s my dream to do it. BTW, did you at least get a download of my BBQ cookbook? You can print that and keep that for now.. Have a wonderful day!